Then the Lord said to Moses, 2 “Look, I have specifically chosen Bezalel son of Uri, grandson of Hur, of the tribe of Judah. 3 I have filled him with the Spirit of God, giving him great wisdom, ability, and expertise in all kinds of crafts. 4 He is a master craftsman ( artisan) , expert in working with gold, silver, and bronze. 5 He is skilled in engraving and mounting gemstones and in carving wood. He is a master at every craft! the fragrant incense for the Holy Place. Each artisan was filled with a special skill given to them by God. They used their skill and knowledge to bring glory to God by building the things of God. When you look at Exodus 36 you see all of the different types of artisans that were needed. The work wasn’t done by two people- but by many. God likes fellowship and unity! There were seamstresses, weavers, embroiderers, framers, builders, woodworkers, goldsmith, silversmith, metalsmith and probably more than I am seeing! It took careful planning, organization, wisdom and knowledge and the Spirit of God to get the work done. This is what I call the beautiful, wonderful, anointed Body of Christ! I wish I could go back in time and see it all as it was laid out and coming together! What a sight that must have been! Why the curtains alone were amazing in themselves! The skilled craftsmen ( artisan) made ten curtains of finely woven linen for the Tabernacle. Then Bezalel[a]decorated the curtains with blue, purple, and scarlet thread and with skillfully embroidered cherubim.9 All ten curtains were exactly the same size—42 feet long and 6 feet wide. [b] 10 Five of these curtains were joined together to make one long curtain, and the other five were joined to make a second long curtain. 11 He made fifty loops of blue yarn and put them along the edge of the last curtain in each set. 12 The fifty loops along the edge of one curtain matched the fifty loops along the edge of the other curtain. 13 Then he made fifty gold clasps and fastened the long curtains together with the clasps. In this way, the Tabernacle was made of one continuous piece. I appreciate artisans of all kinds so when I received this blessing today my heart did a little jig! 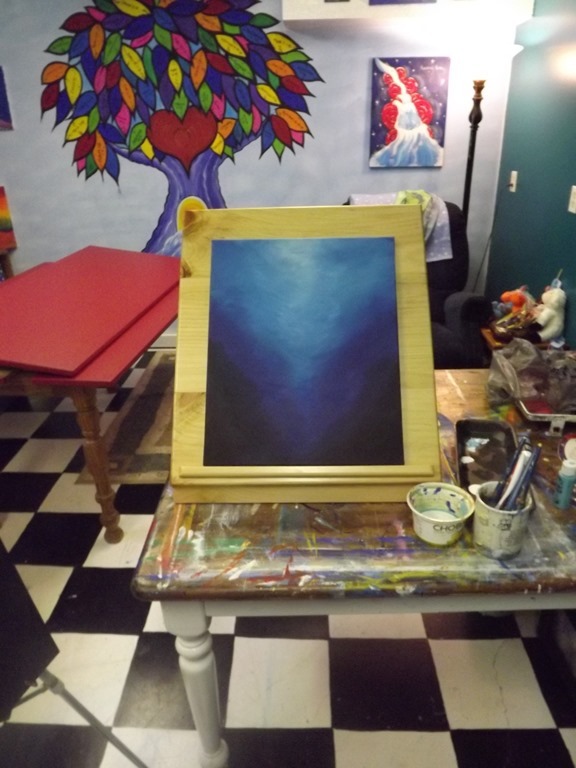 This is a table top easel that was made by a friend. 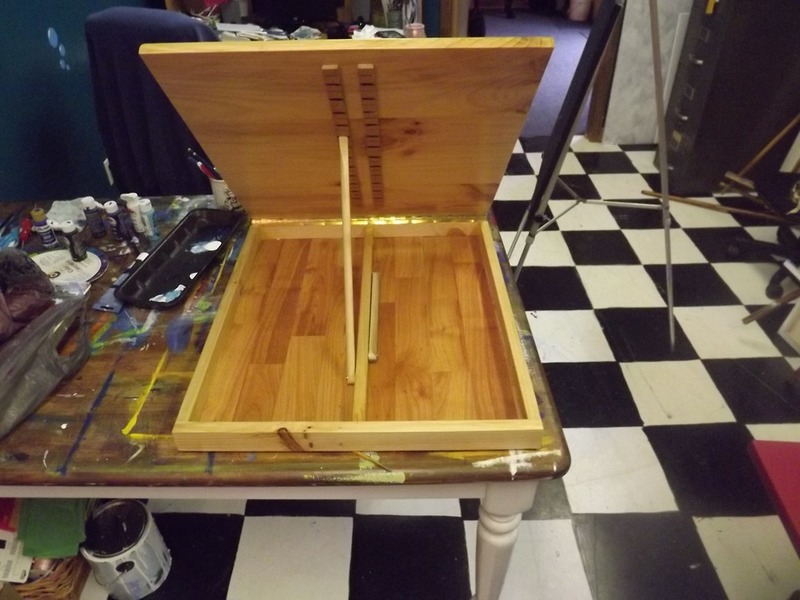 It sits on the table and opens up to an easel and has a place to store paints and brushes. It is quite a beautiful piece and has been handcrafted with much love. 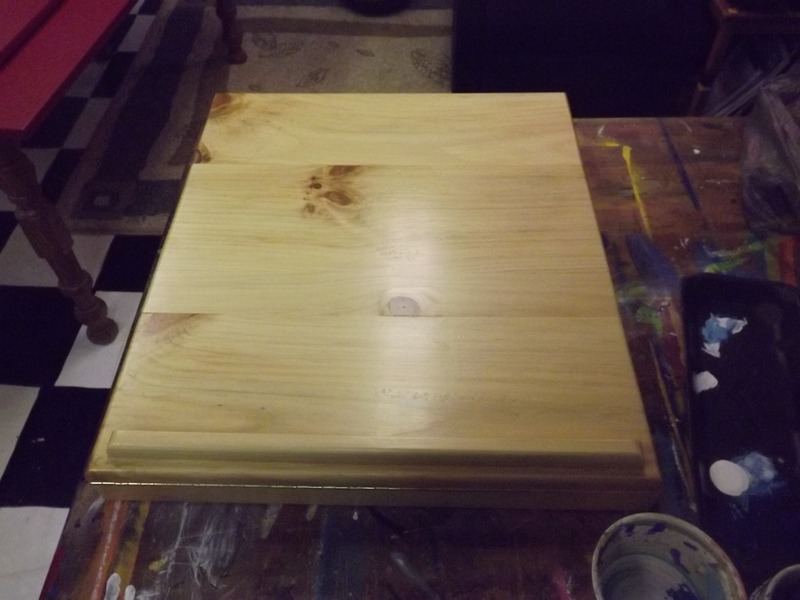 I noticed that there were no nails in it…. ( only screws for the hinge) it is totally glued and all the pieces are in perfect alignment! Thank you my friend! I will cherish it forever! It is absolutely beautiful, before I got to the end I was thinking “I bet Donna wants one of those” and so you own it, lucky you!!!!!!!!!!!!!!!!! Now I am really anxious to know who made it. He is surely skilled. Does he have a little white dog? Oh and the other thing I wanted to say. God really loves color. I must have the most holy kitchen ever ! !